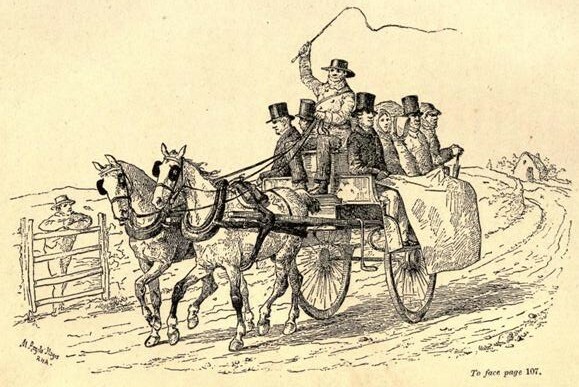 Extract from Hemann Rasche’s article ‘“…A Strange Spectacle…”: German Travellers in the West, 1828-1858’, in the Journal of the Galway Archaeological and Historical Society. The year 1860, a dozen years after the Great Famine, saw the publication of Julius Rodenberg’s Insel der Heiligen (Island of Saints: A Pilgrimage through Ireland) in two volumes. Rodenberg was the secong German traveller in that century to spend any considerable amount of time in the west of Ireland and to write a first-hand account of his experiences. It may be regarded as a somewhat romantic travel novel yet it remains a particularly valuable social document. The arrival of the daily Bianconi seems to be the only form of diversion for the people of Oughterard. “We stopped for a while, the weather was atrocious. A motley group of people congregated around our car.” An old woman offers him a crumpled fruit, and some boys try to sell him pieces of marble which are found here. The scenery beyond Oughterard becomes even more desolate, the sky darker and darker. Only rarely does he see women in red skirts pass by on their donkeys. “The monotony was finally unbearable”, Rodenberg comments. He describes graphically the extent of misery and poverty in that region: wretched cabins in a wet morass, without windows, withour a chimney; the best of them consist of rough stone walls and a roof of straw or grass sods with stones on top.